Mention Yorkshire and Lancashire in the same sentence to anyone from the North of England and chances are they’ll mention the long standing rivalry between the two. Coming from Yorkshire myself it’s slightly controversial of me to devote a post to a traditional dish that goes by the name of the neighbouring county. But Yorkshire gets its fair share of fame. We’re all familiar with Yorkshire puddings, made from a batter of flour, eggs and milk and served as part of a Sunday roast. More recently the county has been broadcast worldwide as the setting of Downton Abbey, the TV show following the lives of the Crawley family. 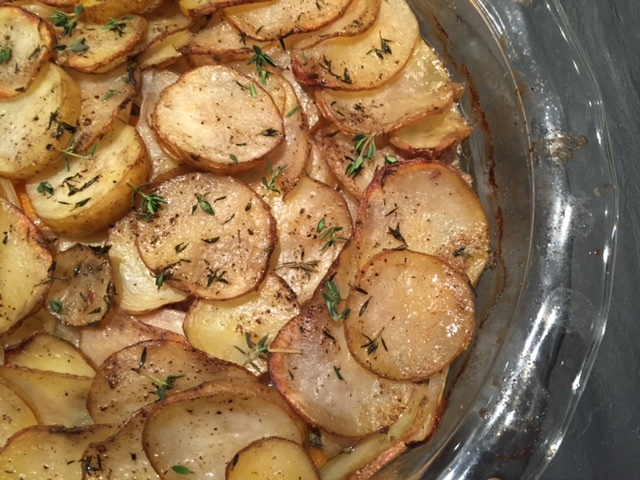 After making Lancashire hotpot for the first time I was so impressed I had to share the recipe (regardless of its origins). I was impressed by its history, by the simplicity of the ingredients and of course by the end result. I based this recipe on Gordon Ramsey’s version that appears in his ‘Great British Pub Food’ cookbook. Lancashire hotpot is a traditional stew of mutton or lamb and onions covered with a layer of finely sliced potatoes. 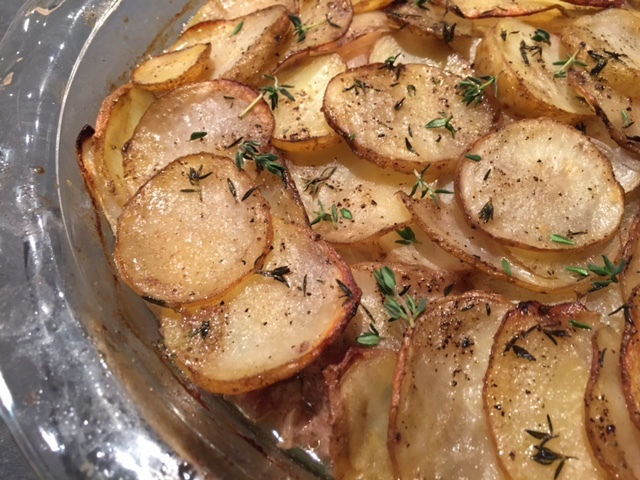 I made a few successful tweaks to Gordon’s recipe, like including a layer of potatoes as a base and using my home made chicken stock in place of lamb stock. Lancashire hotpot originated during the industrial era when staple ingredients were easily brought together in the morning. The dish was left to bake in the oven on a low heat for the entire day. Then, after a hard days slog, the hotpot filled the hungry bellies of a large family of workers. The ingredients here make one large hotpot or two small ones. Either way it’s a generous serving for 3-4 people. Lightly coat the lamb meat using the flour & seasoning mix. Heat 20g butter (or 1 tbsp coconut oil) in a pan. Once hot brown the lamb pieces (it should take a few minutes on each side) then remove from the pan. Add a little more butter to the pan and cook the onions, carrots and garlic until soft. Add any remaining flour to the pan and then pour in the stock and the leaves of a few thyme sprigs. Simmer gently for 5 minutes or so then remove from the heat. Thinly and evenly slice the potatoes. Preheat the oven to 160-170C. Grease a deep casserole dish (or two shallow pie dishes like I used) with butter. Use 1/3 of the potatoes for the base of the hotpot – assemble the slices so they neatly overlap (I read a tip about them resembling fish scales). Then add the lamb and cooked vegetables in layers leaving the stock in the pan. Pour in the stock/sauce until it comes 3/4 of the way up the meat and vegetable filling – the filling shouldn’t be swimming in the sauce. Finally top the hotpot with the remaining potatoes – there should be enough to make two layers. Brush each layer with butter and sprinkle with seasoning and thyme leaves. Cover loosely with a layer of foil. Cook in the pre heated oven for around 2 hours. 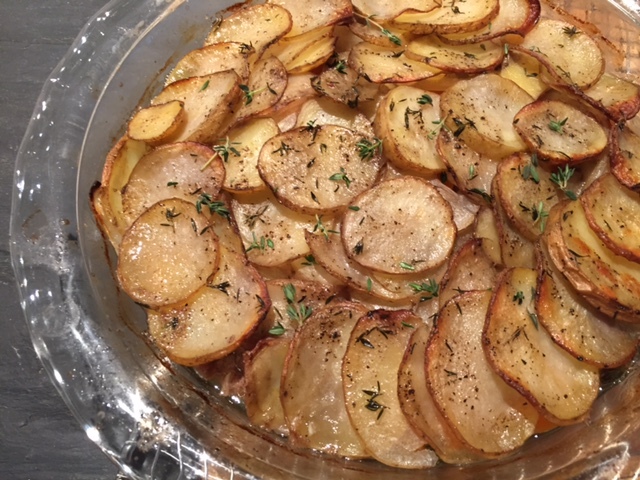 Remove the foil after the first hour and perhaps slightly lift the temperature for the last 5-10 minutes to crisp the potato topping. Allow to stand and cool before serving. Recommended side dishes? Yorkshire puddings of course. Tags: hotpot, lamb, Lancashire, recipe. Bookmark the permalink. The rivalry sounds a bit Melb vs Sydney! I used to live in the Lake District so… 🙂 The spuds on top look so very delish. Hi yes similar to Sydney Vs Melbourne – in the Lake District you’d have been on the Lancashire side of the fence! 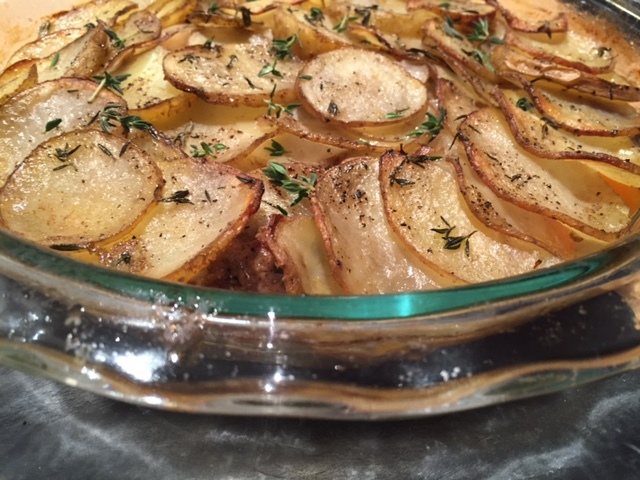 Those crispy potatoes on top look absolutely delish! Thanks Kay and yes they were delicious! Thanks Deanna – yes simple ingredients but amazing flavour – I need to make it again very soon! Aw – thanks. Offal is the best – I am a big fan of chicken livers – perhaps it’s all about proportions so I wouldn’t stretch to an offal only hotpot but would perhaps add 100g per 500g meat…. It’s supposed to be pretty good for you I think! I should probably persist with it a bit more.